Does It Make Sense To Add a Second Story to My House? There are few things more frustrating than not having enough room in your home for your family to truly stretch out and relax. Perhaps you love the location of your current home or maybe the market in your area just isn’t favorable for you to move right now, but you can’t imagine going on with things feeling as tight and crowded as they currently are. What other options are available? Another idea might be to consider a 2nd story home addition. While this isn’t always do-able with every home, in some cases it can be a great way to expand the area you have available while still cherishing everything you love about your existing house. You need to consider a few different things to find out if a second level addition makes sense for your home. A major home renovation like adding a second story will not come without costs. One thing this job has going for it is that there will likely not be much in the way of foundation work that needs to be completed. That being said, the foundation must be inspected to ensure it will hold the weight of the addition. The structure of the second floor must be built, stairs installed a new roof installed (or the old one lifted and reattached) and then you will still have the costs to finish the new area. It’s not cheap, but remember you can always break the project up and start with building the structure and attaching the roof but finish the rooms later. While the costs can seem overwhelming, it is also important to think about the benefits. The most obvious benefit is that you will have more space. For many families, this is priceless. It may mean siblings no longer have to share a room, a work-at-home spouse now has a real office or that an older relative can move in and live with the family. However, there are other benefits too. You will be adding real value to your home–this is something that will pay back handsomely when the time comes to sell your house. Additionally, adding the second story gives you the opportunity to complete other needed renovations around the house at the same time, like upgrading the roof. There are other issues you should consider as well. First and foremost, would an addition be allowed? If you are in a subdivision or certain neighborhood, you may have to request permission from the HOA or even the city before you add on to your home. There’s no use in getting excited about the prospect of a second story until you find out if it is possible. Also, think hard about how long you plan to be in the house. While adding on would add value to your home, it likely won’t add as much as it costs and who wants to go through all of the stress if you won’t be around to enjoy the results of the labor? If everything looks promising, you may find that adding this second story could be the best possible way to give you the space you crave. Request an Estimate for Adding a Second Story Today! If you’re considering the huge undertaking of a 2nd story addition, make sure you trust this job to true experts. 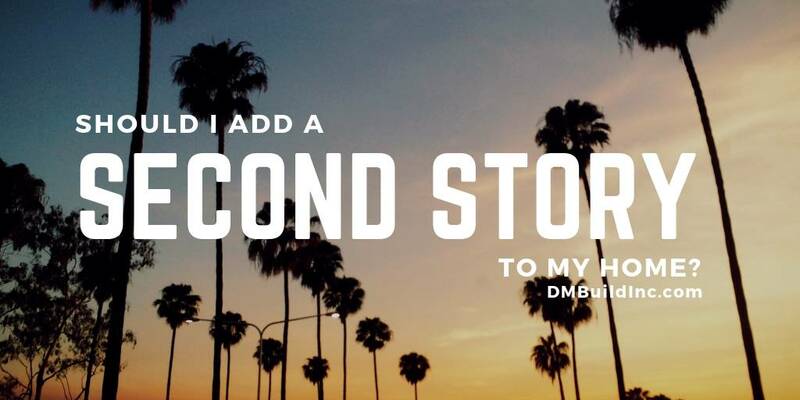 The professional general contractors at DM Building can help you add the second story you’ve always dreamed of–with affordable prices and quality results. Call us today at 760-644-0714 and let us come give you an estimate.